Published on Monday, January 31, 2011. This article appears in the February/March 2011 issue of American Craft Magazine. Rattus Mannus, 2008; mirror sheeting, copper rod, artificial sinew; 5.5 x 25 x 7 in. 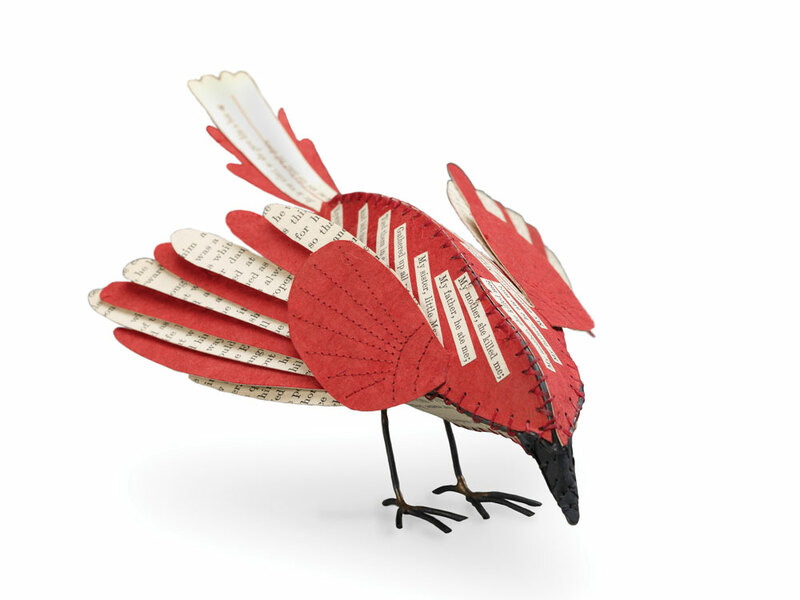 In Anne Lemanski's hands, fascinating materials become spectacular creatures. The sewing of Anne Lemanski's sculptural pieces is the most labor-intensive part of her work. But it's also the most thrilling, because it's when the animal figures she makes come to life. For the "skin" of her pieces, Lemanski uses a fascinating array of materials: rawhide, vinyl, vintage paper, old photographs, wood veneer, even serape cloth and pantyhose. As she stretches a pelt over the skeletal framework of a piece, she watches a sort of soulmate take shape. And she feels a connection. "We are all animals," she says. "Wondrous and mysterious creatures." Recently, in the construction of her biggest, most fantastical creature yet, Lemanski used a new favorite material: Rowlux, metallic-patterned plastic veneers typically used on electric guitars, drums, and commercial surfaces. Rowlux is the perfect thickness for sewing, Lemanski says. The downside? "I have to restrain myself from making entire creatures of gold moiré, because I can," says the 41-year-old, laughing. A clear environmental thread runs through her work. But as she was shaping the copper-rod armature for her latest piece - 21st Century Super Species: Jack-dor - she wanted less obvious symbolism. So the new guy is not a prairie dog holding a grenade or a deer whose hide depicts suburban sprawl; the Jack-dor communicates through sheer volume. "That this creature is larger than the average person speaks for itself," she says. The 8-foot sculpture stands on two anatomically correct horse legs, as a sort of powerful, bipedal declaration to the human world that maybe the animal kingdom has had enough. 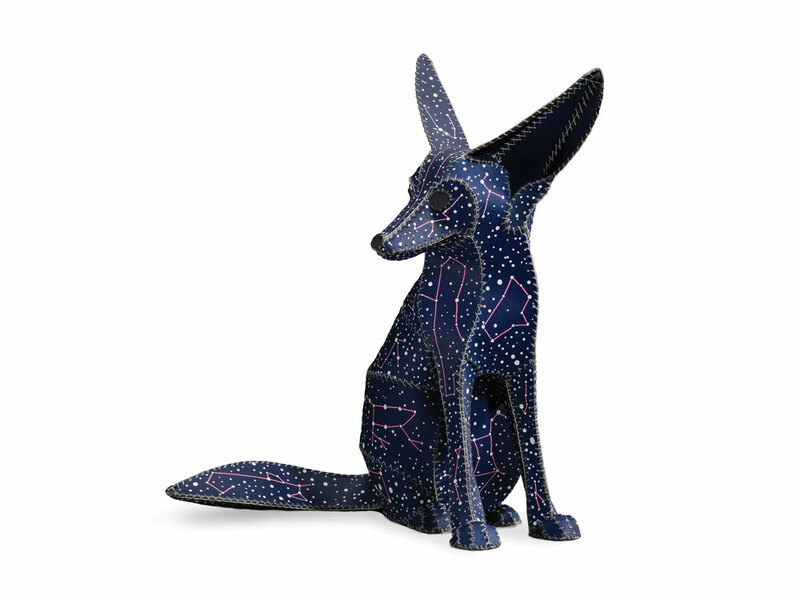 It combines three forms Lemanski loves: the head of a Tehuantepec jackrabbit, the torso of a California condor, and those sinewy equine legs. Two of the component species are critically endangered. Animals have always been close to Lemanski's heart. As a child in rural Ubly, in the thumb of Michigan's mitt, she played outdoors from the minute school let out until bedtime, sometimes bringing home injured rabbits, pigeons, and chipmunks. She helped her more aggressive brother flush out gophers by pouring water down their holes. Now she and her artist husband, Matthew Anders, have a "gigantic dog; he's the love of my life." She has exorcized less charitable feelings about wildlife in her work, too. 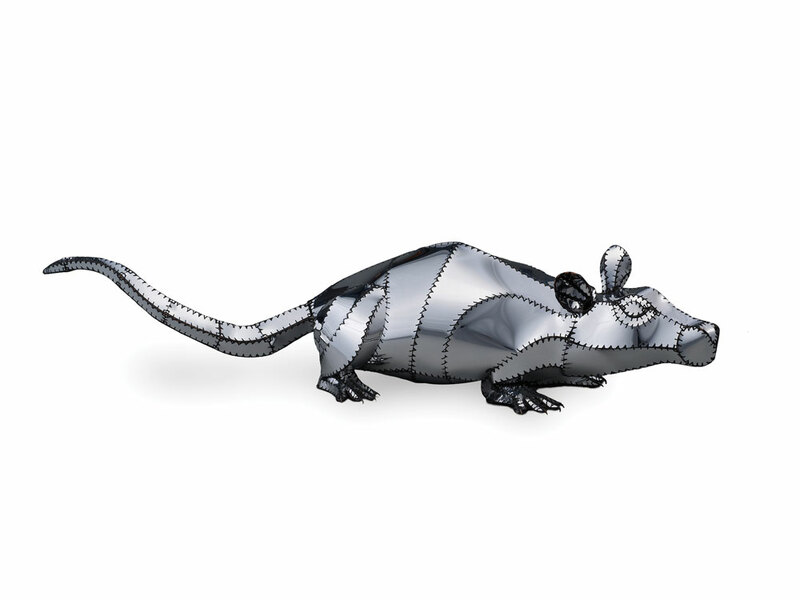 She created the silvery Rattus Mannus around the time of a rodent outbreak at their home in rural Spruce Pine, North Carolina, where she and Anders are constructing studio space out of auto shipping containers. Lemanski graduated in 1992 from the College for Creative Studies in Detroit, taking an eye-opening copper sculpture class at Ox-Bow her final semester. For seven years, she managed a high-end frame shop in Chicago, but the job was so demanding she made only one or two sculptures each year (all of which quickly sold). When she was awarded a three-year Penland artist residency in 2004, she went full-time as a sculptor and never looked back. "Penland changed my life," she says flatly. Lemanski worked 14-hour days for more than two months on the Jack-dor, which made its first public appearance at a November 2010 show at the Milton Rhodes Center for the Arts in Winston-Salem, North Carolina. This year promises to be even busier. The Blue Spiral 1 gallery in Asheville will host Lemanski's most ambitious solo show to date, beginning in July. Her plan is to create all new figures and a sweeping, natural history museum environment. Earlier in her career, Lemanski sculpted guns and even a whimsical history of hairstyles. "Someday I'll be done with animals," she says. But not anytime soon. Monica Moses is American Craft's editor in chief. Juniper Tree Bird, 2009; vintage book pages, copper rod, artificial sinew; 5 x 10 x 7 in. 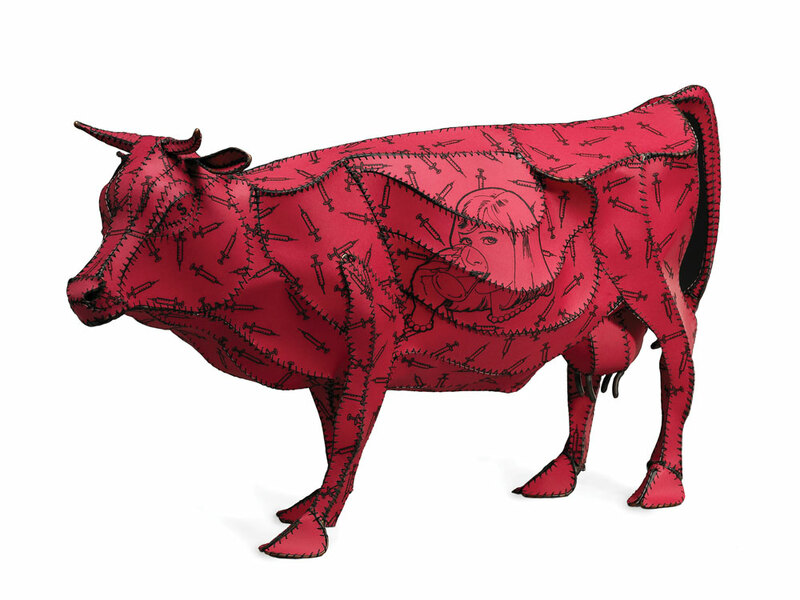 Got Bovine Growth Hormone?, 2007; photopolymer etching on paper, copper rod, artificial sinew; 11 x 20 x 7 in. 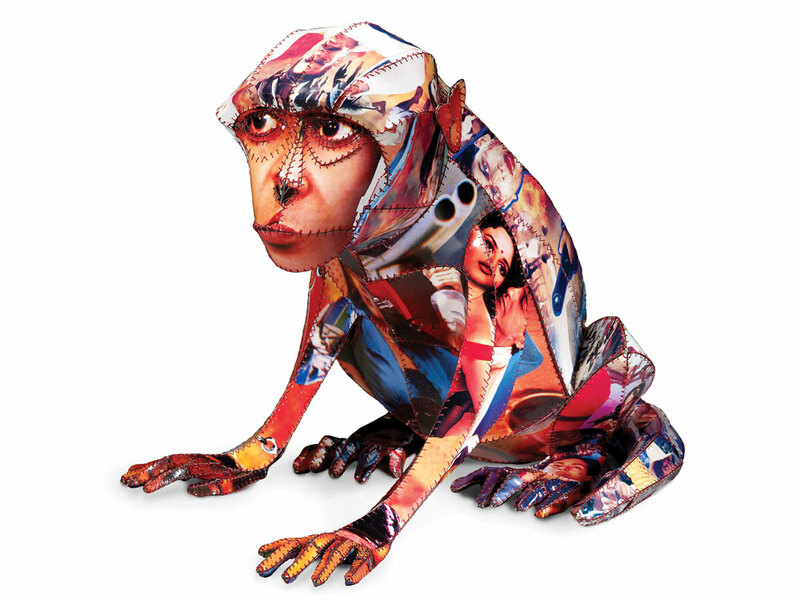 Monkey Goes to Bollywood, 2008; Bollywood lobby cards, copper rod, artificial sinew; 19 x 18.5 x 24 in. Fennec Fox (Dog Star), 2009; ink on paper, copper rod, artificial sinew; 17.5 x 14 x 12 in. 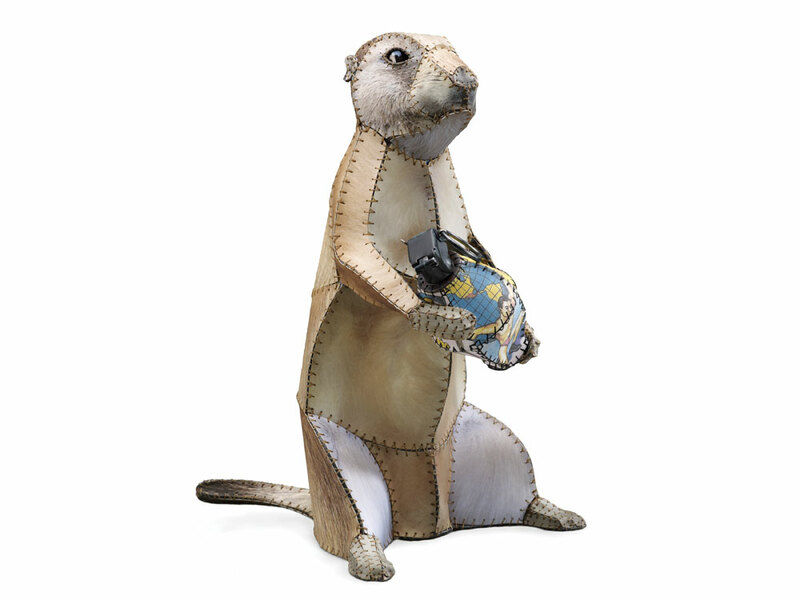 Mexican Prairie Dog, 2010; archival inkjet print on paper, grenade parts, copper rod, artificial sinew; 13 x 7.75 x 10 in. Deerfield, USA (detail), 2008; aerial imagery printed on paper, copper rod, artificial sinew; 36 x 34 x 7 in. 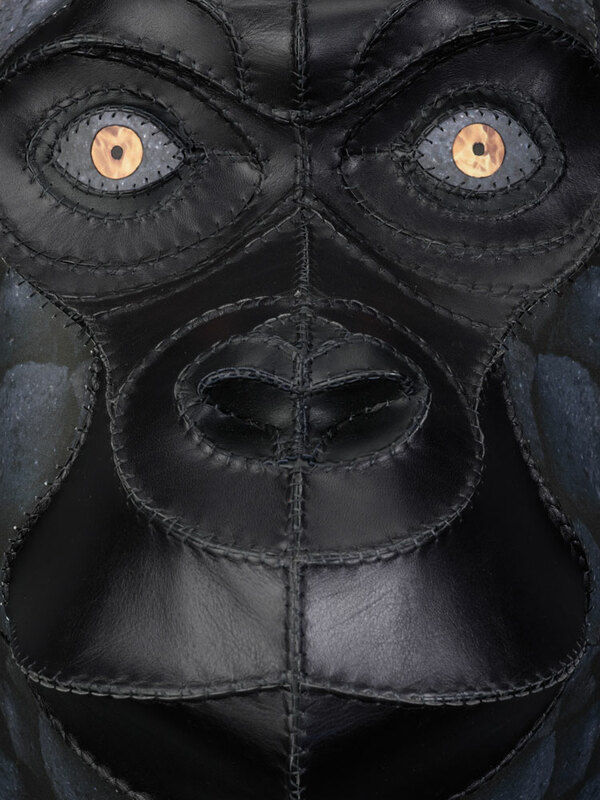 Senkwekwe (detail), 2009; leather, archival inkjet print on paper, copper rod, artificial sinew; 26 x 13 x 17 in. 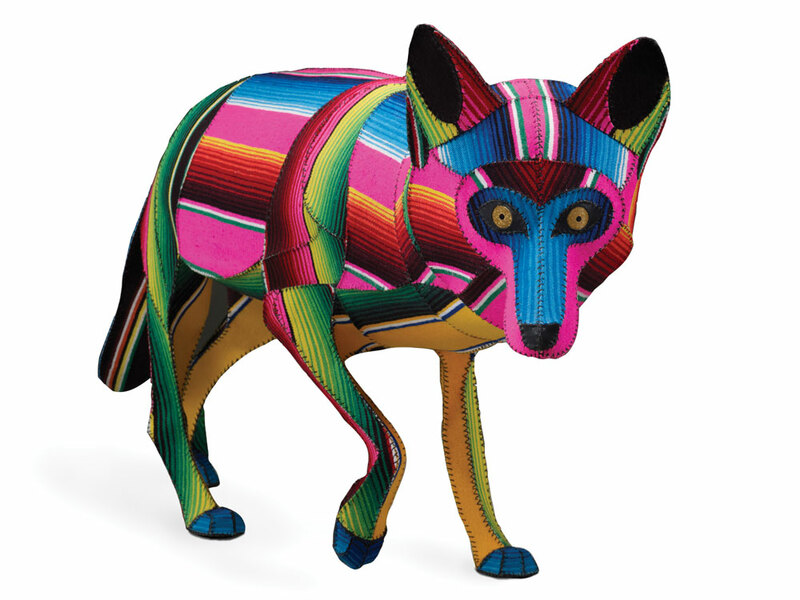 Coyote, 2010; Mexican serape cloth, copper rod, artificial sinew; 25 x 49 x 11 in. 21st Century Super Species: Jack-dor, 2010; Rowlux, birch veneer, copper rod, artificial sinew; 8 x 10 x 4 ft.
Inset: Lemanski's Jack-dor communicates through sheer volume. 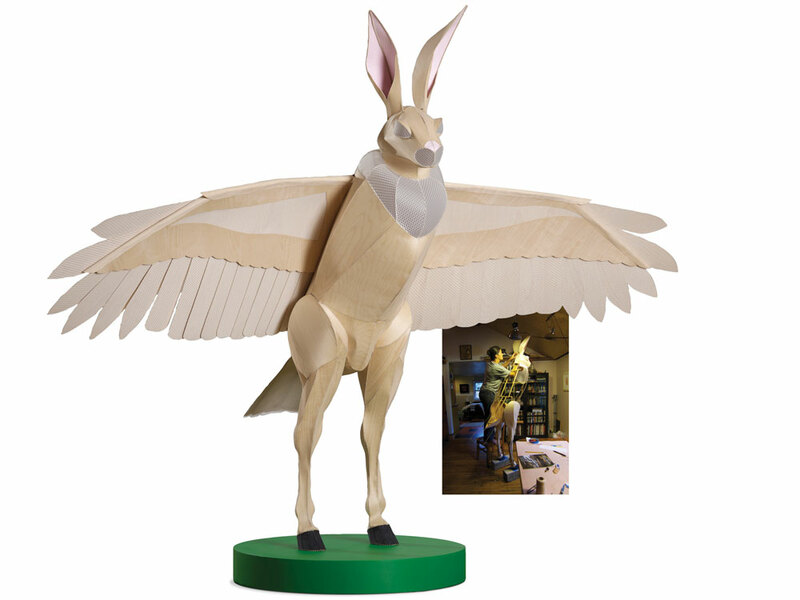 The 8-foot sculpture combines the head of a jackrabbit, the torso of a condor, and powerful equine legs. Artist/naturalist Patterson Clark harvests invasive plants and turns them into paper, ink, and art. 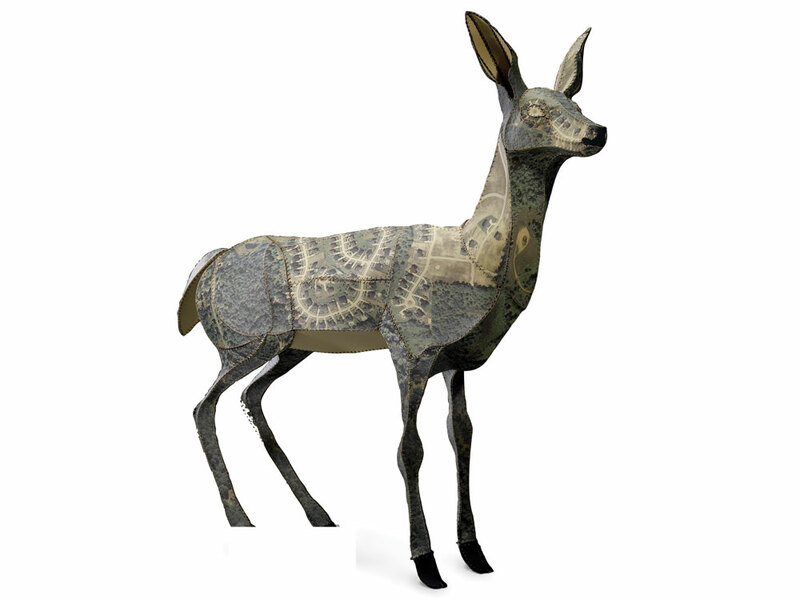 Two artists preserve their nature-based art with an equally natural material. Michael Morgan turns an ordinary building material (brick) into extraordinary landscape forms. Heechan Kim creates exquisitely delicate sculptures of paper-thin wood and prickly metal.